If you're like most people, your days are a whirlwind. Whether you work outside the home or are a stay-at-home parent, caring for yourself, a home, and family can be exhausting. A healthy energy drink may give you the boost you need to get through busy days. This 100 percent organic energy drink was created by former race-car driver, Toby Scheckter. It combines lemon, pomegranate, and elderberry juices with a blend of organic green coffee beans, Brazilian guarana, green tea, and ginseng. Raw sugar cane is added to cut the bitterness; agave is used for their lite version. Both versions contain 80 mg of caffeine. Elderberry contains flavonoids that boost immunity and support overall health and energy; ginseng is thought to increase stamina and reduce fatigue. Scheckter's Organic Energy is available at several grocery stores including Whole Foods Market, Food Lion, Wegmans, Giant, Stop & Shop, Shaw's, and Earth Fare. A 250 mL (about eight ounces) can cost around $2.25. The product is also available by the case at Amazon. Hiball's line of energy drink options includes organic juice drinks, zero-calorie sparkling waters, cold brew coffees, and protein shakes. The drinks get an energy kick from a "proprietary organic energy blend of guarana, ginseng and caffeine in addition to Vitamin B3, B5, B6, B12," according to their website. Drinks are made with fair trade ingredients. Each drink type offers a variety of flavors. Some options include black cherry, grapefruit, wild berry, vanilla, mocha, pomegranate, and ginger ale. Twelve-packs are available to purchase on Hiball's website for $36.00 - $38.00. Hiball drinks are also at Whole Foods Market, Costco, Sam's Club, Amazon, and some natural food stores. Sambazon offers energy drinks containing organic and non-GMO ingredients sustainably sourced in the Amazon. Their Amazon Energy drink is made of acai berries and acerola cherries. A combination of green tea, guarana, and yerba mate provide an energizing kick. Each 12-ounce can contains 50 calories and nothing artificial. Amazon sells a 24-pack of Amazon Energy for around $50. You can also find the drinks at most natural health food stores and some grocery stores including Whole Foods Market and Safeway. 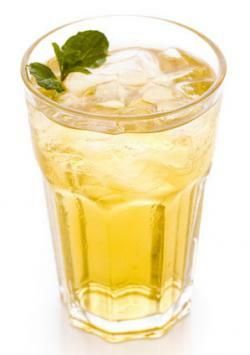 You can make your own energy drink using fresh fruits, vegetables, and/or tea. Wash all produce before processing; peeling is optional. 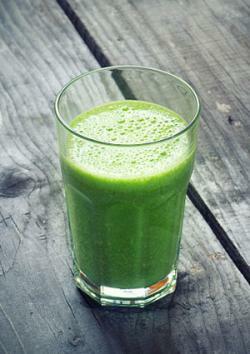 Large pieces should be cut into small to medium-sized chunks before placing in blender or juicer. Start with these recipes and change them to taste. According to a BBC News article, a University of Exeter study showed beet juice increases stamina and may help people exercise longer. Adding carrot and apple improves taste and helps dilute the juice, reducing the risk of side effects. The recipe makes one eight-ounce serving. 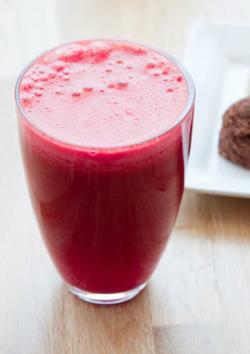 Add all ingredients to a juicer or blender. Drink straight or pour over ice. Green tea provides a hefty caffeine boost but often without the uncomfortable side effects of coffee or cola. An eight ounce cup of green tea includes on average 50 mg of caffeine. The recipe makes one eight-ounce serving. Pour one cup of boiling water over tea bag(s); steep for five minutes. Add the lime juice and mint leaves and steep mixture for at least one minute more. If desired, add your favorite sweetener. Green veggies are packed with energy-boosting vitamins. They taste earthy on their own, so add an apple for sweetness. This recipe makes one eight-ounce serving. Drink right away straight or pour over ice. The next time you're in a slump and need a pick-me-up, consider purchasing a healthy energy drink made with fruits, tea, and herbs, or whip up a drink from ingredients you have on hand. Either way, you'll avoid consuming excess sugar and artificial ingredients. 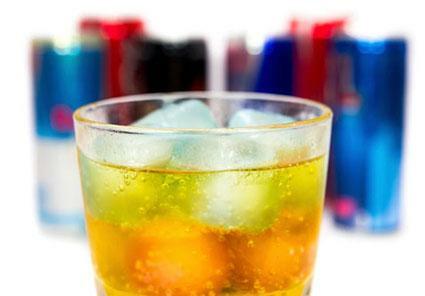 Healthy energy drinks contain caffeine and/or other natural stimulants. If you have an uncomfortable reaction to any energy drink such as a racing heart, anxiety, feeling jittery, or difficulty sleeping, stop using the drink and contact your doctor. Know how many other caffeinated drinks you consume to prevent exceeding the recommended caffeine dose of 400 mg per day.